I’ve had several people tell me they plan to make the trip out to Black Canyon and Scouts Cove after reading my last trail article. As promised, now I’m going to show you how to make this a loop trail with even more great things to see. 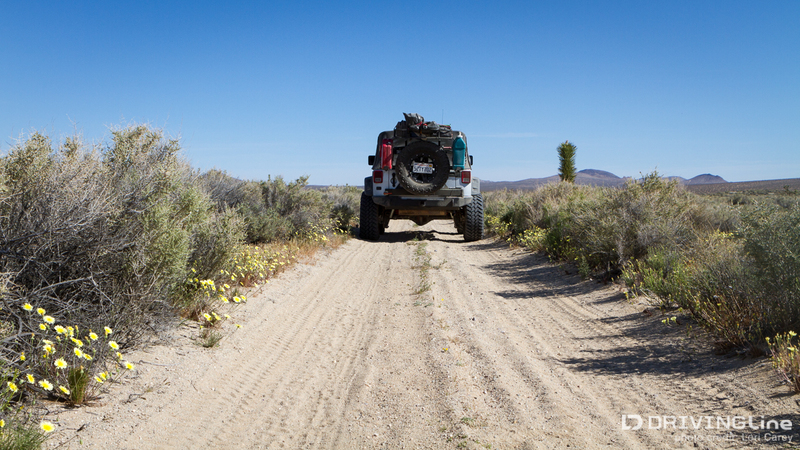 We left Scouts Cove following a trail that was lined along the edges with yellow wildflowers, something we don’t often get to see in the California desert, especially after a few years of drought. 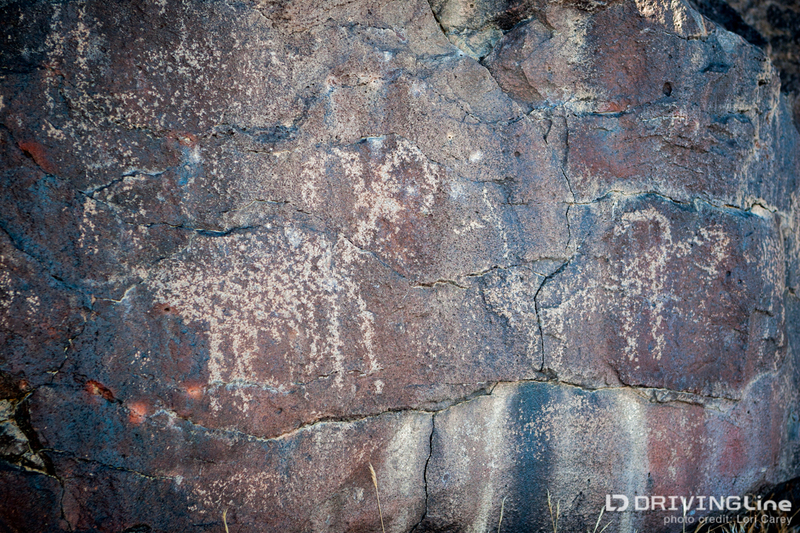 Bearing left on EF 373 (which still shows as Black Canyon Road on my GPS) we passed by the Indian Caves and more boulders with petroglyphs before reaching Inscription Canyon on the north side of Black Mountain, 3.5-miles since rejoining the trail from Scouts Cove. 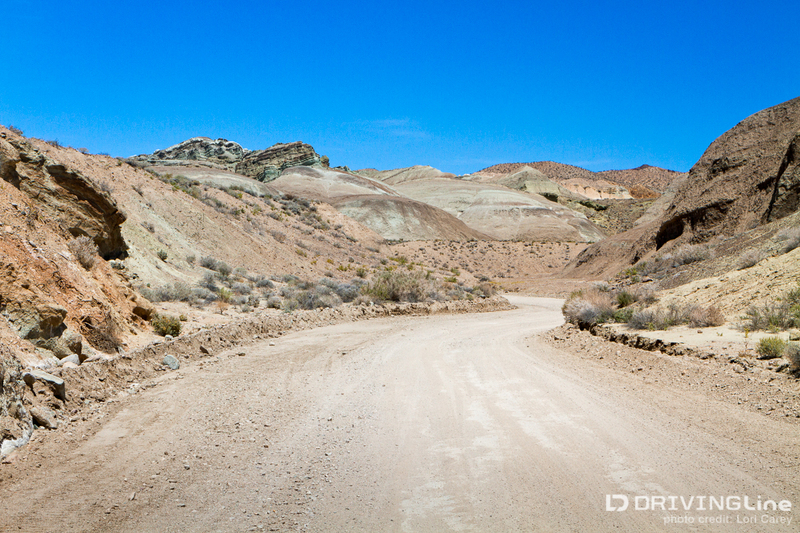 To put the location in perspective, Inscription Canyon is 42 miles deep into the desert northwest of Barstow. Inscription Canyon is a short and narrow free standing canyon; it’s basically two walls of volcanic rock standing side by side. The photo here was taken during a previous visit when there was snow in the desert. It seems that every time I visit this location magical things happen. There is a barrier at the entrance to the canyon. You’ll want to park your vehicle and walk through the canyon to see an incredible number of petroglyphs lining the walls. 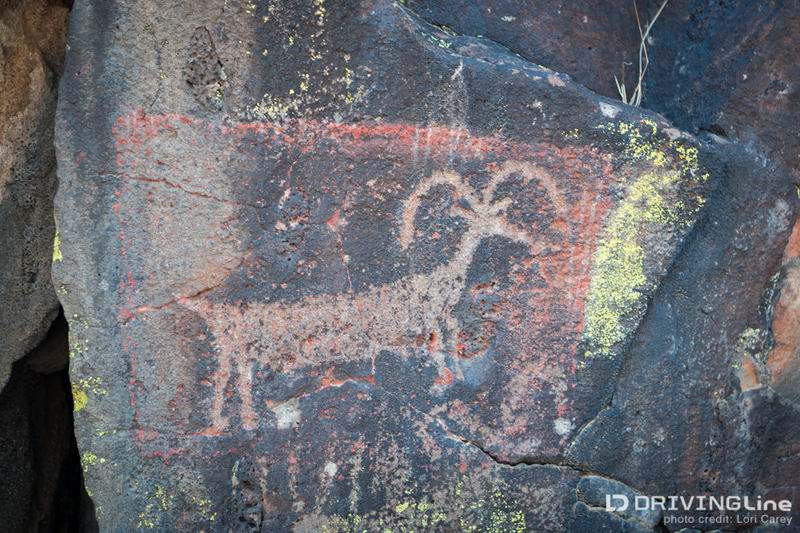 Many of the panels depict bighorn sheep; others show humanoid figures, atlatls and geometric designs. There are also some faded pictographs to find in the western end if you look carefully. Some of the petroglyphs are covered with brilliant colored lichens. Experts say that the vast array of different styles used indicate that the art was created by people of several different cultures over a great many years, and that the earliest art was created by Archaic people several thousand years ago. 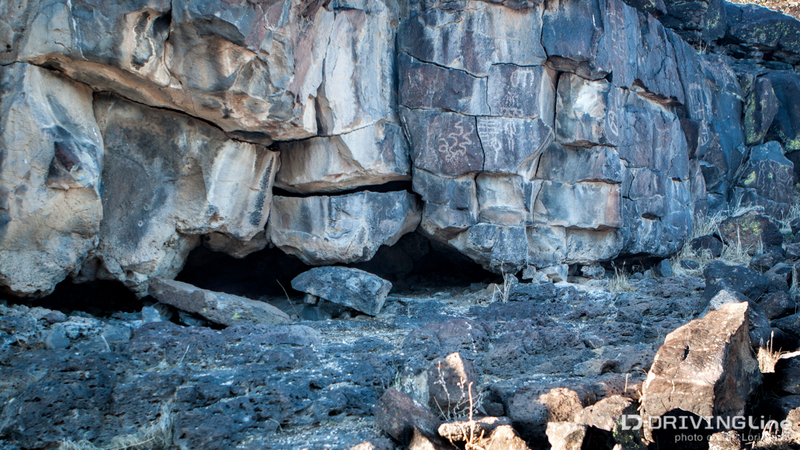 If you take the time to explore the area surrounding the canyon you'll find even more petroglyphs. We continued on Black Canyon Road after leaving Inscription Canyon. Just a few years ago this trail would continue across Superior Dry Lake and we could pick up Starbright Trail to make a loop, but military base expansion resulted in the loss of this section of trail. We reached the sign at a well-graded road and turned right. There are a few options you could make at this point. 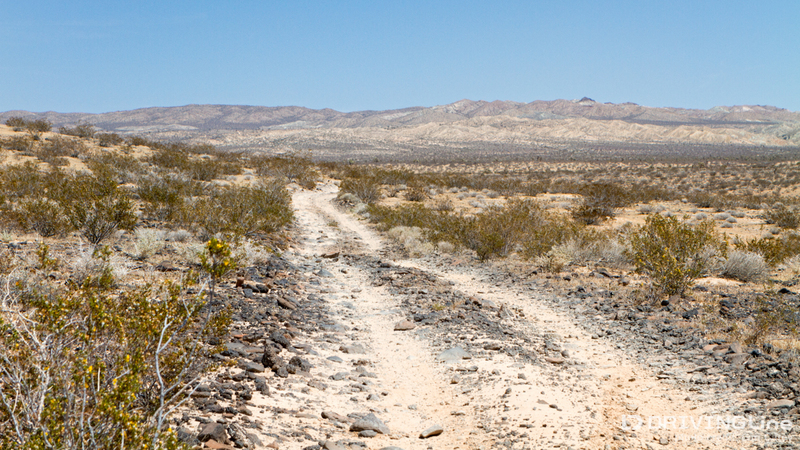 The easiest is to follow the graded road until it reaches Copper City Road, turn right and take that out to Barstow. If you want to have more fun on the trail, you can turn right onto the next trail you see and follow it around Black Mountain. 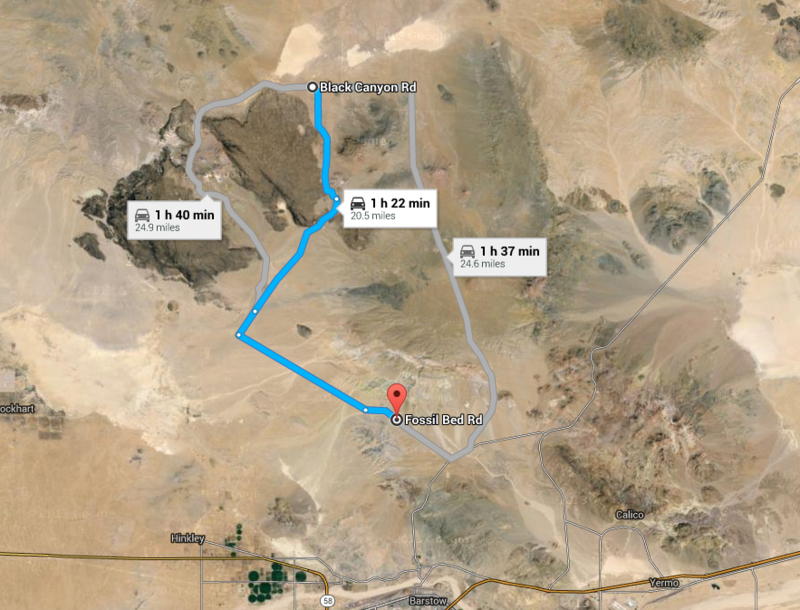 After circling around the mountain the trail splits (35.214290 -117.104417) and you could take either route back out to Hinckley/Barstow. You could also backtrack and pick up the trail that goes between the mountains. If you haven’t visited the Rainbow Basin Natural Area before, it’s worth a visit while you’re out this way and I recommend turning right at the Y onto 99/County Route 20771. 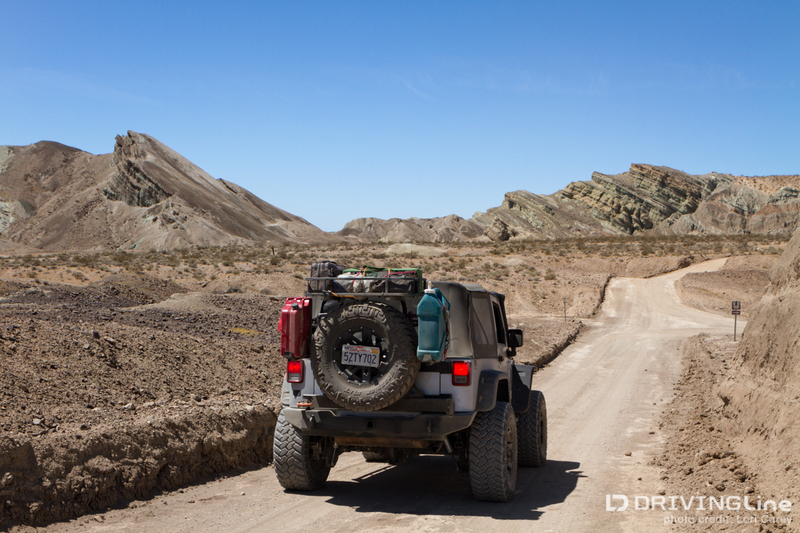 Follow that for 6.5 miles and then turn left onto EF401 – Fossil Bed Road. 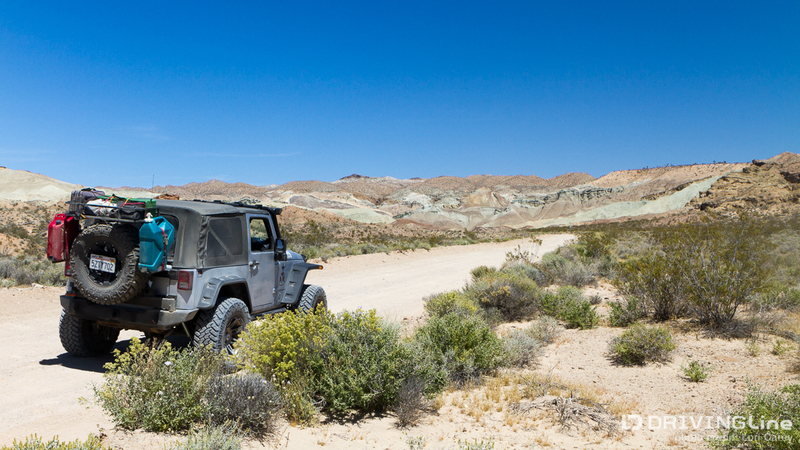 In about another 6.5 miles you’ll reach the entrance to Fossil Canyon Loop Road, a one-way loop trail through Rainbow Basin. This Area of Critical Environmental Concern has incredibly amazing colored rock formations and is one of the most beautiful locations in the Mojave Desert. The Owl Canyon Campground is also located in this area if you prefer something more than primitive camping, but be warned that it currently has no water. There is no visitor center or interpretive information in Rainbow Basin, just a parking area near a vast crater that usually has a crowd of what I assume to be geology students. Backpacking is welcomed but no fires are permitted outside of the Owl Canyon campground. I’ve vowed that one of these days I’ll make it to Rainbow Basin in the early morning or late afternoon so I can really capture the amazing colors. The trail was very well graded when we visited this time, but typically you need a high clearance vehicle. The last time we were here the trail was extremely eroded with deep chasms and we came across an SUV that couldn’t get through one section. The SUV had already suffered some damage to the undercarriage and driver had decided to backtrack on the one-way, incredibly narrow trail instead of causing further damage to his vehicle. That is a very dangerous thing to do, especially on a twisty trail with many blind spots. 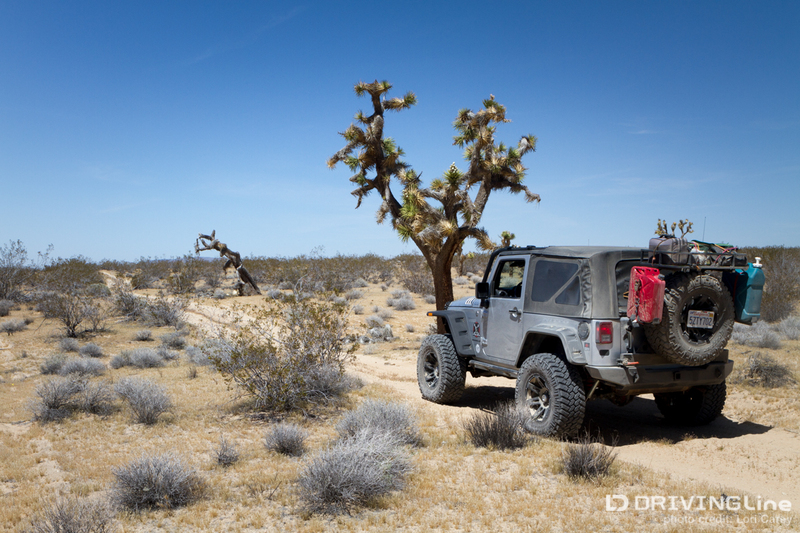 Trail conditions change all the time out in the desert. 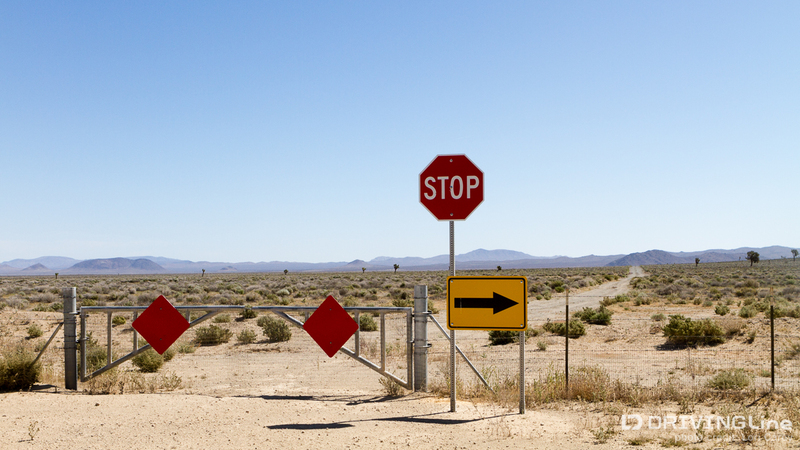 At the end of the loop make a left back on Fossil Bed Road, then a right on Ft. Irwin Road back to Old Highway 58 in Barstow. For fun we decided to take the trail in the opposite direction to see where it would go. 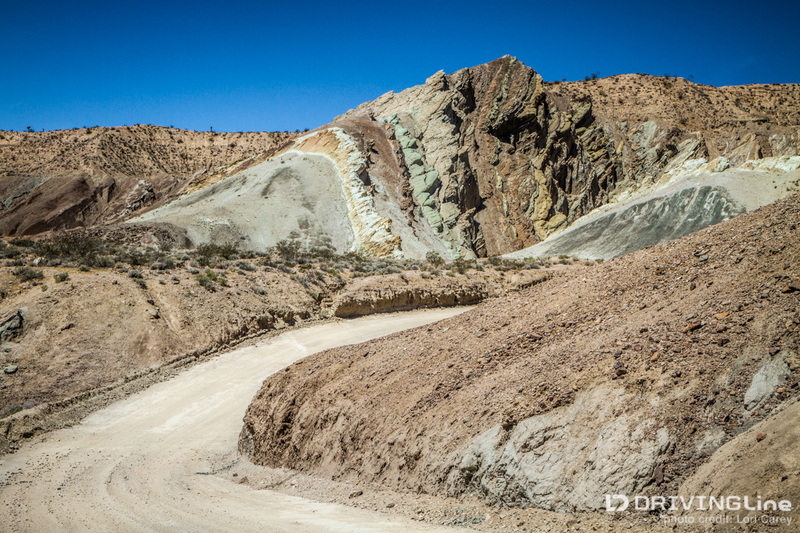 The sand got very deep once we got away from Rainbow Basin and you definitely need your sand driving skills out here. Fossil Bed Road forks and both are named Fossil Bed on the maps and GPS. 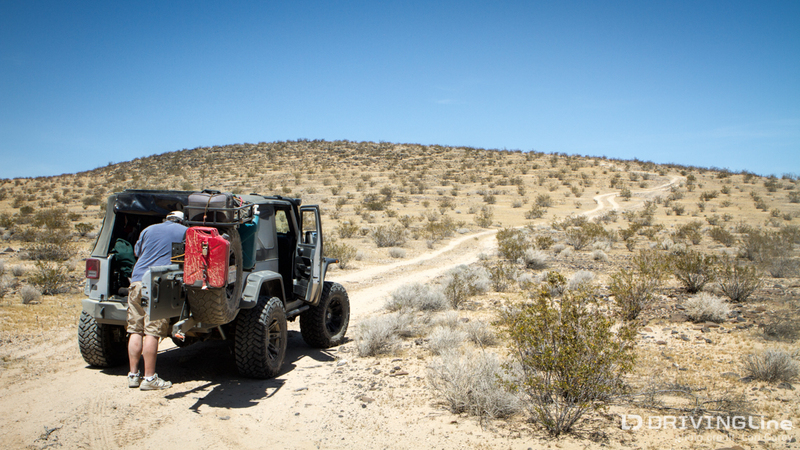 Bearing to the right will head back toward Black Mountain and meet up with Black Canyon Road. We took the left fork. 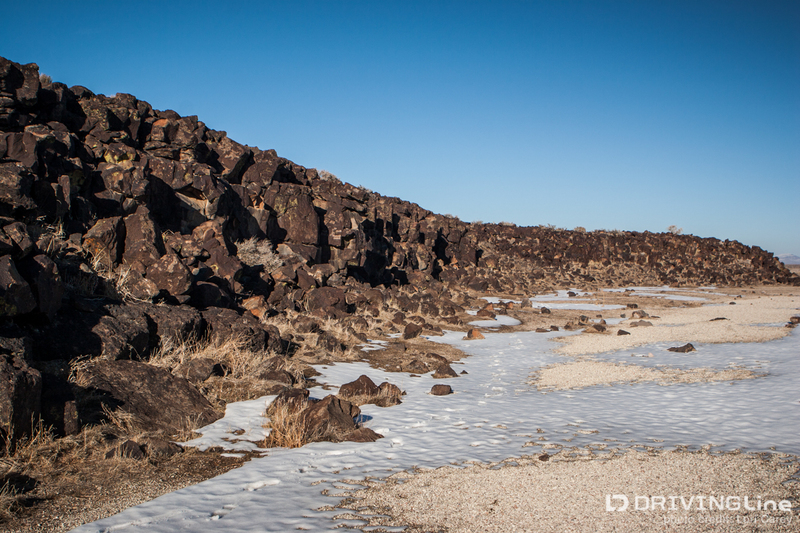 The trail skirted the edge of Superior Dry Lake before entering an area of volcanic rock. Those sharp jagged rocks might be small but they can be brutal on tires and I’m glad that my Nitto Trail Grapplers are tough enough to handle them without worry. 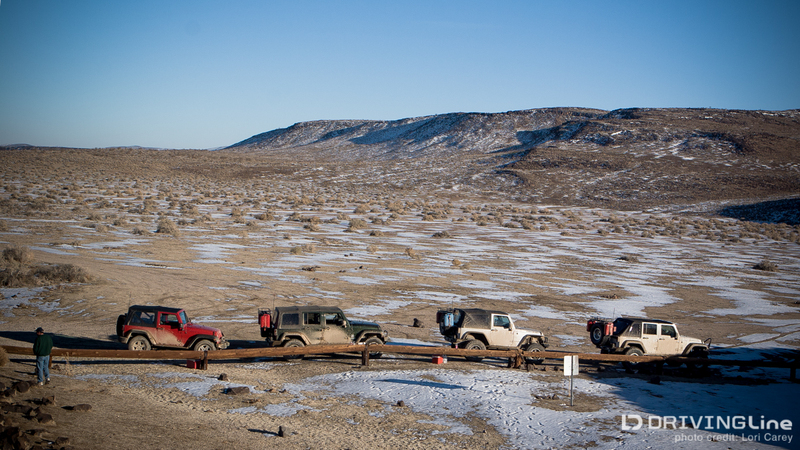 We had been following the trail for quite some time when we decided to dig out the cooler and stop for lunch. There’s a whole lot of nothingness out here. I find it peaceful, but many describe it as barren, harsh and foreboding. The trail SHOULD terminate at Hinckley Road near the start of our journey, but when we got close to town we discovered that the locals had a very large junkyard right on the trail. It was impassible with too much glass and sharp metal. We backtracked to last trail we had passed and took that back to pavement in Hinckley. This section of Fossil Bed Road isn’t really worth your time, but it’s always good to know alternative routes when you’re in an area. If you visit Black Mountain and Inscription Canyon, please show it the respect it deserves. Vandalism and theft of an archaeological site is a felony that can carry a 10-year prison sentence, and we should all be caretakers of this beautiful land and these ancient sites to preserve them for future generations to enjoy.